This lovely luxury villa is surrounded by the extraordinary setting of the hills at the outskirts of Florence. This farmstead is composed of the master villa and a farm with cellars equipped for the production of wine and olive oil. The main complex features spacious rooms spread over three levels and two noble towers. This property was an Etruscan settlement and has been inhabited since the 5th century BC. It was converted into a noble villa by the Frescobaldi family in the 18th century; the charming small theatre and the chapel (both undergoing restoration works) date back to that period. The impressive lands surrounding this property cover approximately 380 hectares and include olive groves, vineyards, crops, grazing lands and an important variety of woods which, in the 19th century, was cultivated by Marquess Cosimo Ridolfi, an enlightened enthusiast of botany. He also created this property romantic park, which is an experimental botanic garden for many exotic species. By walking along this property's natural paths you can admire some notable tree varieties alternated by some typical structures such as fake ruins, the stables, the old furnace, or the Medieval ice-house. In the Italian-style garden surrounding the villa there are some statues, water games, the “green theatre” which is currently under renovation and some stone details such as the majestic arch known as the Arch of Man. 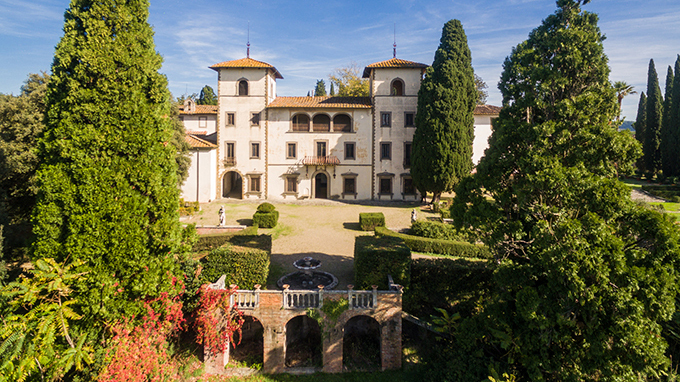 This villa has maintained its splendor by adapting and renovating itself through the ages, starting from the Renaissance. Today, it features a timeless charm which makes it a real dream villa in the heart of Tuscany. Florence is universally known as the city of art, thanks to its incalculable heritage of works, palaces and monuments which transform the city’s streets into an extraordinary open-air museum. The heart of Florence is Piazza della Signoria, dominated by the towering Palazzo Vecchio and the Galleria degli Uffizi. Just a few steps away, there is the Cathedral, where Brunelleschi’s superb dome is accompanied by Giotto’s bell tower and the Baptistery of St. John, with its celebrated bronze doors. The river Arno runs through the middle of the city which is full of beautiful luxury villas for sale. The most famous of the bridges crossing the river, the Ponte Vecchio, is adorned with jewellery shops housed in small cabins attached to the bridge, a construction technique found nowhere else in the world. Carrying Vasari’s noble corridor from one bank to the other, the Ponte Vecchio was also the only Florentine bridge to make it through the Second World War without suffering any damage. The left bank of the Arno, or the “Oltrarno”, is an area that still provides a feel, among its centuries-old crafts shops, of the Florence of yesteryear, as described by Marcello Vannucci and Vasco Pratolini. On the hills at the outskirts of Florence, surrounded by lush vegetation, there is this luxury villa for sale.